The walls around the food stand have been moved back and “The Mess Tent” is now open and serving guests. It’s now just a matter of weeks, or maybe even days, before all the walls come down around Skull Island: Reign of Kong at Universal’s Islands of Adventure. I think the most exciting thing I saw today wasn’t even something you can see… It was the beautiful original score for Skull Island now being pumped into the area. (You can listen to a sample here, or in the video below.) See the video as well as images below to get a better look at The Mess Tent, some more little touches that have been added, and listen to the new area music. Opening date? The media preview for Skull Island, along with the new Sapphire Falls hotel, is scheduled for June 22-24. I’m assuming the grand opening will be around this time. Usually soft opens happen in the weeks leading up to a new attraction’s grand opening. 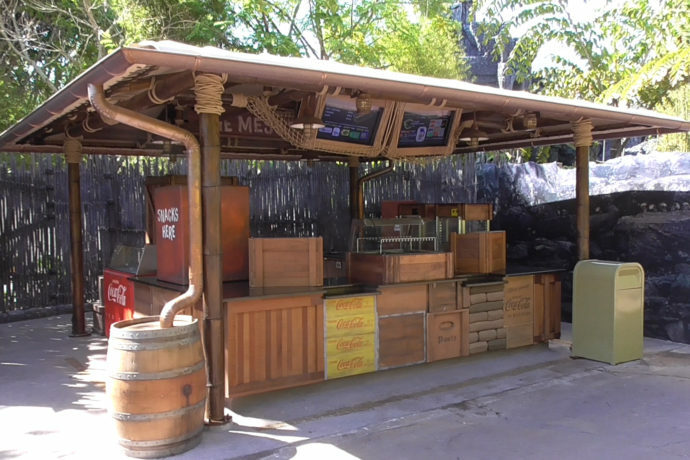 Soft openings, or technical rehearsals as it’s called by Universal, allow team members to get used to operating the ride during a practice period. During this time some effects may not be running as problems are fixed throughout testing. Soft opens may only happen for a couple hours a day at first. They will last longer as we get closer to the official opening date until eventually it is open all day. Check back here and I will be posting when soft opens have started. It could begin any time from now until the end of June. Stay tuned! Something added on top of queue, maybe more sensors? That’s all for this Kongstruction update. Check out the last Kong update with vehicle testing here. See all the Kong updates and subscribe to the feed for more continual updates!